Has the need to acquire things taken over your life? Impaired your mobility, driven your family away? If you need help more than you need clutter, you CAN beat it. Hoarding disorder finally became officially recognized as a form of mental illness in 2013. It’s an insidious problem that takes many different forms and becomes more difficult to treat the longer it goes unchecked. Like an anorexic looking in the mirror who sees an obese person, most hoarders suffer from distorted thinking about the chaos around them—they see some semblance of order—and the relative valueless and useless nature of their stuff—they see indispensable treasures. Hoarders over-identify with things as if the things are an actual part of them. But we are not our stuff. You can’t take it with you. What do you want your life legacy to be? Welcome to Hoarders Anonymous. Terrence Shulman has been a certified social worker and addictions therapist since 1997 and has worked effectively with hoarding issues whether they are linked to compulsive shopping/spending, shoplifting/stealing, or to hoarding/cluttering. He has extensive experience helping recovering hoarders, and has been featured as an expert on The Today Show, TLC's "Buried Alive", 20/20, and The Anderson Cooper Show, to mention a few. The Shulman Center can help you beat your hoarding addiction and give you the tools you need to live the life you want to live. Get help now… before it’s too late! 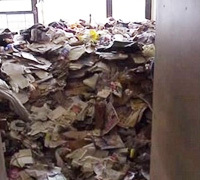 Hoarding affects an estimated 6 - 15 million Americans. Some hoarders may be able to address their hoarding with the help of professional organizers but most will need the help of a trained, skilled professional therapist who specializes in helping the hoarder and his/her family/friends understand what is at the roots of this increasingly common and complex behavior. When a person begins to understand his/her own hoarding and has the right support to take incremental steps toward letting go of the stuff that keeps him/her stuck, a new door is opened and life truly becomes possible, relationships can be restored, and a deep sense of shame and helplessness is lifted, replaced by a feeling of liberation and hope. Our program provides compassionate, confidential and non-judgmental counseling, giving you the tools you need to change your life. The Shulman Center Program [link Counseling page] has been continually evolving and fine-tuning from its earliest successful results. Expert Therapy/Counseling sessions are available by phone with Terrence D. Shulman JD, LMSW, ACSW, CAAC, CPC -- attorney, addictions counselor, and expert on Hoarding/Cluttering. Typically, 90% of our clients enroll in and successfully complete the basic program. Our goal is to educate individuals and the community at large about the complex motivations and recovery treatment process for these behaviors, while emphasizing personal responsibility and accountability. Compulsive hoarding is the excessive acquisition of possessions, even if the items are worthless, hazardous, or unsanitary. Compulsive hoarding impairs mobility and interferes with basic activities, including cooking, cleaning, showering, and sleeping. The Shulman Center will help you understand and manage your hoarding disorder and its consequences. Let the Shulman Center’s one-on-one and family counseling help you get on the right track. The Shulman Center offers counseling services via Skype, by phone, or videoconferencing. Click to learn about counseling. Cluttered Lives, Empty Souls, Compulsive Stealing, Spending & Hoarding, written by Terrence Shulman, has helped countless people with addictive behaviors and is used in conjunction with his counseling program. The benefits of personal support could make all the difference. There are many support groups across the country that meet locally or by phone. Find the one right for you. There are several different types of hoarders. Learn the facts. Are you a hoarder or clutterer? There are simple checklists that can answer that question. Read articles written by Mr. Shulman and others. Read ARTICLES and learn more about hoarding / cluttering. View our hoarding VIDEO archive collection. Need proof that it works? Read these TESTIMONIALS! Don't hesitate! You can start your new life NOW!